The Haven of Pelargir (Garth of Royal Ships) is by far the oldest permanent settlement in Gondor. Like its sister city, Umbar, it was founded by men of Westernesse in the mists of Second Age. Together they have a long and irreconcilable history of contest, and occasionally, war. Umbar is older, more venerable and strategically situated in the nexus of southern trade lines; a former bastion of King's Men (Ad. Arûwânai). Pelargir is her stronger and more populous little sister, mother colony of the Faithful (Elendili, ad. Nimruzîri). Even when both havens have been ruled by a common dynasty (933-1448), their life has been one of fierce competition and civic pride. 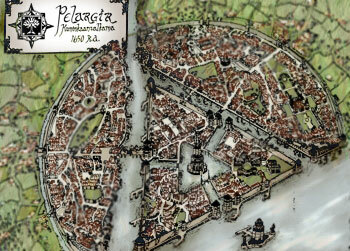 The history of southern Gondor begins and ends with Pelargir. Not only is Pelargir the greatest haven of the South-kingdom; it also enjoys the distinction of having been the first among all the dwellings of the Dúnedain to have received the authority under Númenórean law to conduct its affairs according to the precepts and ideals of the Faithful. Finally, apart from the temporal power of its leaders, the walls of Pelargir enshrine one of the hallowed places of Gondor: the fabled Well of Ulmo, Lord of the Deeps. The original settlement was built on a triangular limestone island at the confluence of rivers Anduin and Sirith. 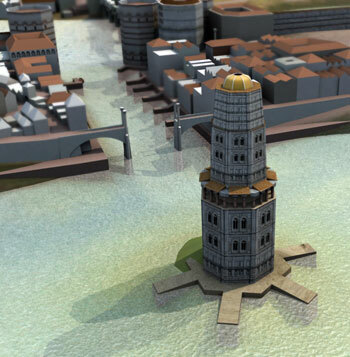 Behind the island (which is now the Quarter of the Faithful) lay the waters of the garth, a protective enclosure ringed by quays and ramparts that served the Royal Fleet. Access to the garth could be blocked by huge iron chains. The harborworks themselves extended into three independent towns. Pharazôn's Moat (Cheiriant Pharazôn) constructed late in Second Age separated the northeastward-facing quarters from the land, turning them into artificial islands. The haven's official foundation date is thought to be II 2350, when a colonial constitution was granted by king Tar-Ancalimon. During the late Second Age, Pelargir enjoyed preeminence among the federated colonies of Belfalas Bay, and the annual gathering of the Pelargirean League always took place there. Pelargir faced fierce competition from other federated colonies, such as Bâitha'n-Kadîr (League of Cities in Bellakar), Lond Daer Enedh and Umbar herself. During the repressive reigns of Ar-Gimilzôr and Ar-Pharazôn, Pelargir lost control over its own garrison, but the colonial constitution and autonomy was never revoked. The constitution continued to function after the Downfall of Númenor, being confirmed by Elendil and his sons in II 3320, but was finally nullified in III 754 by King Siriondil (748-830), whose son Tarannon had dissolved the Pelargirean League in his pacification of Anfalas. Pelargir and her territories were formally united with the Kingdom of Gondor. Nevertheless, it was not until the conclusion of the Kin-strife that the actual civic affairs of the haven were directly subordinated to royal authority, and even this was rescinded by King Aldamir in III 1490 and later by Tarondor in III 1664. During the Later Kingdom of Gondor, Pelargir became a major contributor to Odo Lynd, a naval levy instituted by Aldamir. Entire shipbuilding industry was contracted to private individuals and corporations. Later, when Odo Lynd was abandoned following the end of the kings, Mardil the Steward left the matter of coastal defense to the Council of Pelargir, whose membership now consisted of an hereditary body of nobles. The ancient haven continued to decay, but some of the ancient Númenórean traditions never departed, although the haven was now only a town divided into several warring districts led by local noblemen. Some shipbuilding facilities were maintained to the end of the Third Age. The Council of Pelargir traced its traditions back, however spuriously, to the first councils held by Imrazôr the Númenórean, first leader of the Faithful in Middle-earth. Pelargir is also the seat of the Lord (or prefect) of Lebennin, the legate of the Pelargir district of Lebennin, the military commander of the Lebennin Territorial Corps, and the Admirality and the Navy Board, giving the city an unusual amount of royal officials. Despite serious reform attempts by the provincial governor, the tripartite political structure and the overlapping military authorities creates a lot of hassle and waste. During the early years of Pelargir (100-754), the Haven was controlled by an aristocracy (the High Council). The leading families, living from land and rents, competed with each other in an endless struggle for supremacy withing the Pelargirean League. After the League was forcibly dissolved, King Tarannon Falastur levelled most of the ancient Númenórean villas in the Quarter of the Faithful and replaced them with his own grandiose public buildings: the Abad Arahir, seat of the royal plenipotentiary in Pelargir, and the Court of the Elendili. A new Council of Pelargir, where all artisan and trade colleges could have their say, was constituted from the middle classes. The workings of the council were supervised by a royal legate (Herdir) with powers to veto. During the Age of the Ship-Kings, membership in the Council of Pelargir was legally bound to the trade corporations. It consisted of 36 councilors elected for life, and four executive officers elected for four years acting collegially in the capacity of the Squire of Pelargir. Speaker of the Council was responsible for religious and civic seremonies. Three Major Guilds have 24 permanent seats in the council while Minor Guilds have only twelve. 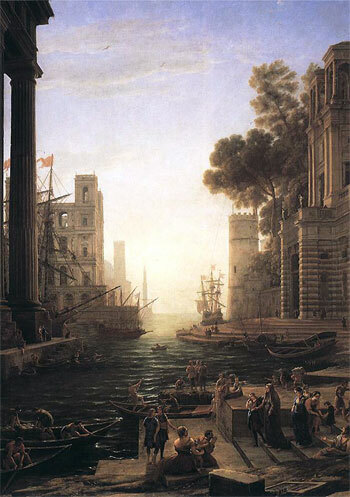 12th century of the Third Age saw a sudden re-emergence of aristocratic power, when old noble families started to take part in the trade corporations; first as financiers, then as leaders of Gondor's new maritime policy. In 1120 King Ciryaher Hyarmendacil I nominated Lord Urthel Lintoron as the Prince (condir) of Pelargir, with executive powers in place of a royal plenipotentiary. The haven was controlled by the Lintoroni until the 14th century, when it was gradually taken over by the royal House of Calimehtar. Last of the Calimehtars and leader of the resuscitated Pelargirean League was King Castamir (1437-1447). After the Kin-strife Pelargir was put under a tyranny of military dictatorship, backed by King Eldacar with the task of suppressing the rebellious people of Pelargir. The existing council was dissolved and the city and its rural districts were controlled by the Othir Aran ("King's Commander"), a high-ranking army officer. Crown-prince Aldamir was appointed Lord of Lebennin. The provincial government and local council were purged and staffed by known loyalists, many of whom came from northern Gondor, and were not particulary popular. Military posts formerly reserved for southern noblement were sometimes occupied by Northmen from Rhovanion. Old constitution and autonomy of Pelargir was restored by King Aldamir in 1490, with the much-diminished Council of Pelargir back in power. However, he was not entirely satisfied with the solution, and in 1501 appointed two brothers and supporters, Orophin and Pelethanor Orchaldor, as royal stewards and plenipotentiaries with extended powers. In 1515 he appointed Túrin son of Orophin as the Prince of Pelargir, with absolute power over the council. During the reign of Túrin Orchaldor, Pelargir regained its former glory and possibly surpassed it. But at the same time the trade corporations that had made up the Council of Pelargir started to degenerate into criminal and corrupt enterprises. The Major Guild seats in the Council became practically hereditary. When Túrin Orchaldor died in 1597, his royal benefactor stripped his family of all its extensive properties and tried to restore the Council. It did not curb corruption, but brought political violence, which Túrin had skilfully contained, back to the streets. Years of 1621-1625 and 1633-1638 were all marked with rebellion and bloodshed. Civil blood flowed in many "petty wars" between Major and Minor Guilds, but even more destructive to the city and the morale of its citizenry was war. In 1634 Pelargir became a theater of a major battle. 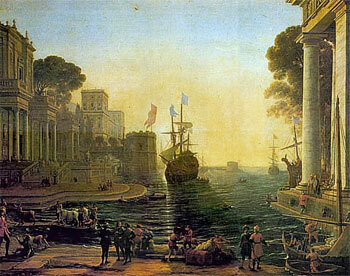 During the Second Corsair War, rebel troops led by Angamaitë and Sangahyando, descendats of Castamir, sacked the city and burned its quays. War, plague, impoverishment and the defunct political system all contributed to the decay of the haven. Population, which had been over a hundred thousand, sunk to less than 50,000. 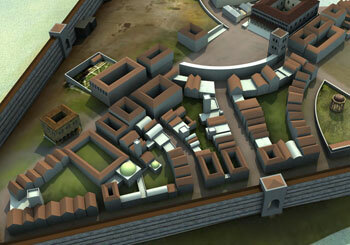 Large areas of the city fell in disrepair and ruin. Quays and bridges deteriorated. Young King Tarondor tried to contain the decay by appointing his energetic Captain of the Ships, Elenaerion, as the royal plenipotentiary and legate of Pelargir. But Elenaerion could do little to reverse the trend, as he was fully occupied elsewhere. It was evident to all that Pelargir had become a hotbed of crime and sedition. In 1654-1656 another wave of violent revolts broke out among the citizenry, and the town of Enta Sirith declared its independence from the haven. The Council of Pelargir, dominated by a group of criminal families, did nothing or didn't want to do anything to stop the rebellion. It was only the end of the Fifteen Year's War and appointment of Mordulin Orchaldor-Eldalótë – grandson of Túrin – as the Prince of Pelargir with full executive and legislative powers and royal backing, that could turn the tide. Mordulin quickly consolidated his hold on Pelargir. He proved to be a very succesful ruler and a hard bargainer. He negotiated a truce between the Minor and Major guild, ordered a thorough purge of Pelargir's criminal corporations, and initiated a large-scale re-development of the decayed districts. Thousands of refugees, former sailors and unemployed veterans were drafted to public building projects. The historical population of Pelargir has usually varied between 50,000 and 150,000 individuals. It is, apart from the many foreigners, of the same Dúnadan-Gwathuirim mixture as one finds in the Lebennin plains. However, the artisans and merchants of the city have acquired a standing and influence one rarely sees in the countryside. Their businesslike approach to life has come to influence the attitudes of the whole populace. The overwhelming majority of Pelargir's citizens depend on the sea for their livelihood. This includes several thousand private fishermen and their families. In addition, where all all the activities and businesses without which shipping would grind to a standstill: chandlers, outfitters, brokers, agents, marine insurance offices, shipyards, and so on. 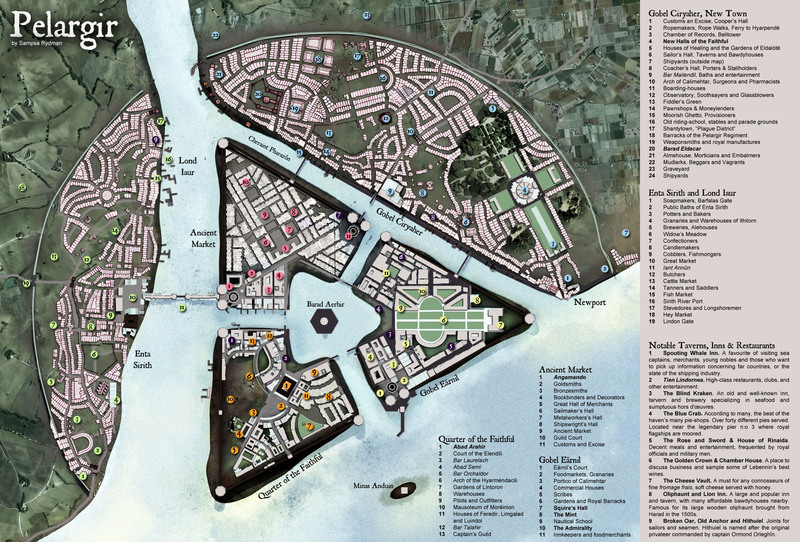 Pelargir is also the main base of Gondor's navy, another fact that sets the tone of city life. Sailors and marines on leave sometimes act with less restraint than honest citizens would like. Certain customs have developed in Pelargir that may confuse strangers. Fish or some other kind of seafood is eaten with every meal (and not to do so is considered faintly barbaric). Eating meat more than once a day, on the other hand, is thought of as an excessive luxury even by the rich. A large number of obscure nautical terms ("clean slate", "pay the devil" etc.) have entered everyday speech, and give the Pelargirean dialect a distinct flavor. After the Kin-strife, merchant shipping in Pelargir was in a sorry state. Many ships had been lost, crews were scattered and even nautical knowledge was in short supply after the major exodus to Umbar following the defeat of Castamir. Recovery was fairly rapid, however. Commerce was the city's lifeblood, and every measure was taken to restore favorable business conditions, though it was at first restricted to domestic trade. While coastal traffic soon reached a volume comparable to pre-war days, capacity for and expertise in ocean sailing never recovered completely. 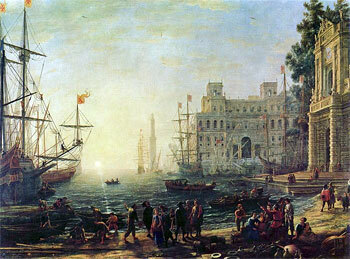 In addition, merchant ships now tended to carry larger complement of armed men to discourage at least the casual pirate. This, and the losses caused by the Corsairs, cut into the merchants' margin of profit, limiting formerly large, spectacular trade ventures and fostering a cautious approach. Even so, from the sixteenth century to the twentieth, the number of ships that passed through Pelargir's haven in a year was impressive.